A well presented semi-detached house located to the south of the city, just off Skellingthorpe Road. The internal accommodation briefly comprises of Main Entrance Hall, Lounge, fitted Kitchen with Dining Area, First Floor Landing leading to Three Bedrooms, Bathroom and Separate WC. Outside there is a driveway providing off road parking and gardens to both the front and rear. There is also an outside WC and outside storage area. The property further benefits from UPVC double glazing and gas central heating and viewing is recommended. LOCATION The property is situated to the south of the city, just off Skellingthorpe Road. The area is well served by local amenities and is within close proximity to Hartsholme County Park. There is easy access to Lincoln City Centre via Skellingthorpe Road and Triton Road or alternative access via the Lincoln A46 bypass. MAIN ENTRANCE HALL With UPVC main entrance door and side window, single radiator, stairs to the first floor, under stairs storage cupboard and coving to ceiling. LOUNGE 12′ 3" x 11′ 9" (3.73m x 3.58m) , with UPVC window to the rear elevation, living flame gas fire with feature surround and coving to ceiling. KITCHEN DINER 18′ 10" x 11′ 7" (5.74m x 3.53m) , fitted with a range of wall, base units and drawers with work surfaces over, sink unit and drainer, space for fridge freezer, single radiator, part tiled surround, built-in storage cupboard and cloaks cupboard, UPVC window to the front elevation and pantry. With UPVC window to the front elevation and plumbing for washing machine. 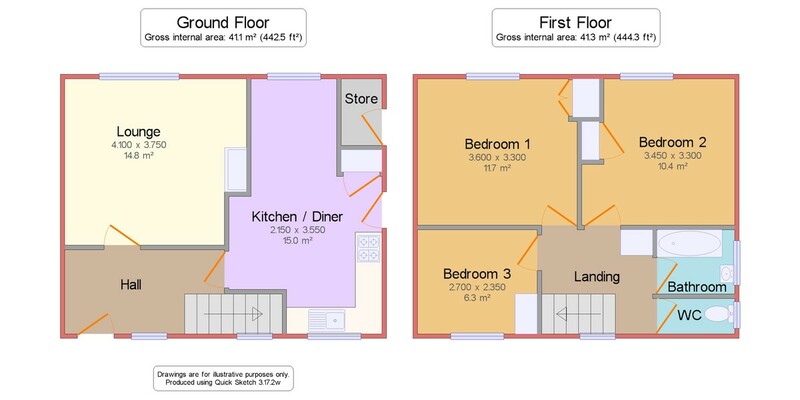 FIRST FLOOR LANDING With coving to ceiling, access to roof void, cupboard housing the gas central heating boiler and UPVC window to the front elevation. BEDROOM 1 11′ 11" maximum x 10′ 9" (3.63m x 3.28m) , with UPVC window to the rear elevation, single radiator and built-in double wardrobes with storage above. BEDROOM 2 10′ 9" x 10′ 1" (3.28m x 3.07m) , with UPVC window to the rear elevation, single radiator, built-in storage area and coving to ceiling. BATHROOM With suite to comprise of bath with shower over and wash hand basin, part tiled surround, single radiator and UPVC window to the side elevation. WC With WC and UPVC window to the side elevation. OUTSIDE There are gardens to both the front and rear. Front gravelled garden with driveway providing off road parking. There is a covered side entrance leading to the outside WC and outside storage area. Rear garden with lawned area, paved walkway, a range of flowerbeds, mature shrubs and a patio area. With WC, light and UPVC door and window.